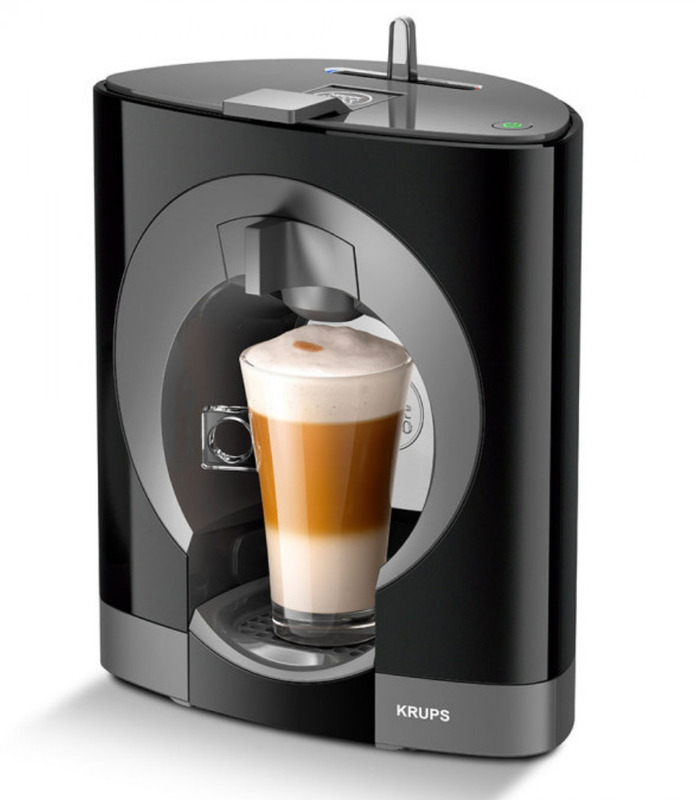 Add the Nescafe Dolce Gusto brand to the Krups brand, shake them up, and what do you get? Well, apparently the ultra-modern Nescafe Dolce Gusto Oblo By Krups. And, alongside its space-age looks, it also appears to be pretty good at producing good quality coffee, if its 4.5-star ratings are to be believed. Add in an affordable price, and you’ve got a machine that’s a regular guest on the best buy lists. In line with other Dolce Gusto machines, this machine’s thermoblock water heating system heats up in around forty seconds. Not stunningly fast compared to some, but fast enough to satisfy all but the most impatient coffee fans. You’ll know it’s hot enough when the power switch is solid green. When your new machine arrives, you’ll find that it’s supplied with eight pods, which may vary, so you can start discovering your new coffee pod machine immediately. This unique, stylishly curvy Dolce Gusto model is simple to use. It features a power button, and a lever. The power button has a light that indicates when the machine is ready to use. The lever sets and controls the water temperature and flow. The machine controls the pressure itself. While the cup tray is adjustable and can take most cups and glasses, it isn’t high enough for some latte glasses or for insulated mugs. If you’re a latte fan, you might find yourself having to invest in some shorter glasses. 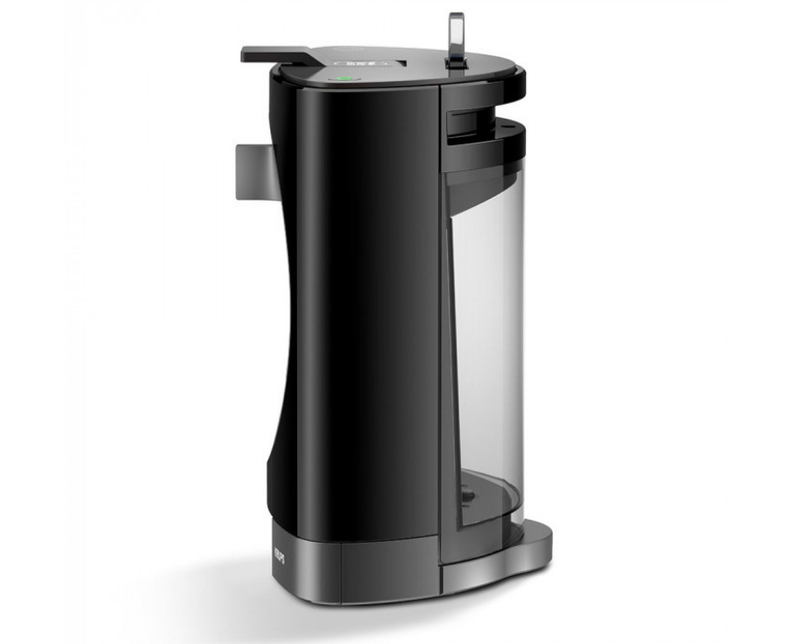 Like other Dolce Gusto machines, the Oblo has a 0.8 litre water tank. Not huge, but slightly above average for many coffee pod machines. It’s enough to make several cups of coffee before you need to refill the tank. How easy it is to clean the Nescafe Dolce Gusto Oblo? Descaling is necessary to keep any coffee pod machine in good working order. 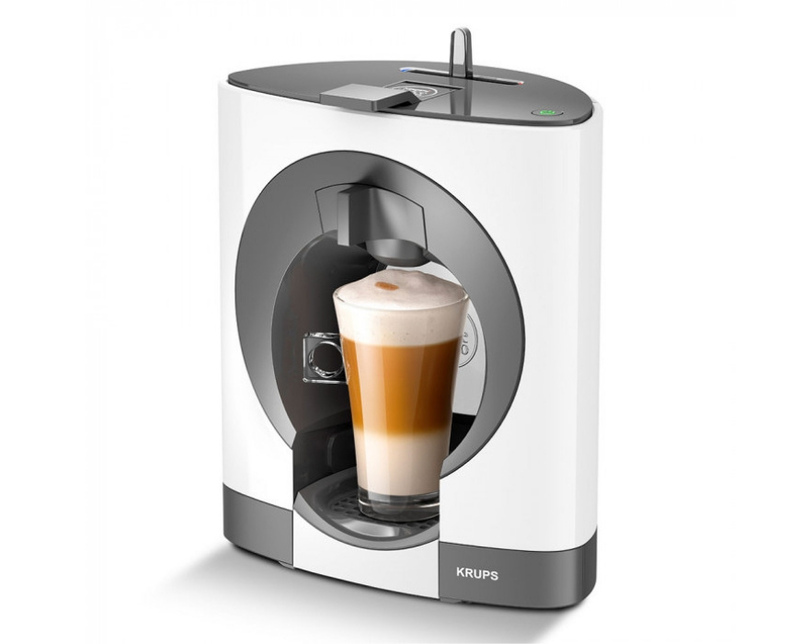 Cleaning the Nescafe Dolce Gusto Oblo By Krups is pretty simple. Add a descaler to the water tank – Nescafe recommends its own brand – and run through on first hot, then cold, for 45 seconds each, with a two minute waiting period. Then repeat with cold water. The injector pin, the part that pierces the pods, can become blocked. The machine is supplied along with a special cleaning pin just for that situation. Usually, a coffee pod machine is about pressing a single button and getting a no-fuss cup of coffee. This isn’t the case with this machine. Instead, it’s up to you to pour the right amount of water through the coffee pod using the lever on top. 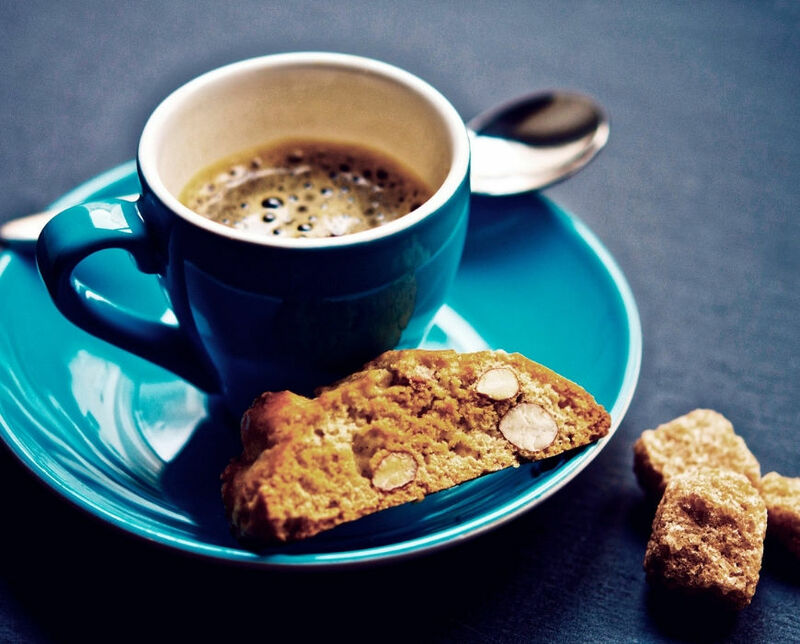 While pouring a black coffee is fairly straightforward, users report that it’s much harder to get the volume and taste right with ‘double’ coffees, such as cappuccino, latte or macchiato. One common complaint about the Oblo is that the coffee is a little cool, even on the highest temperature setting. Another criticism is that the unusual shape of the water tank makes it difficult to replace if you remove it to fill it. This issue can easily be solved by just topping up using a jug. 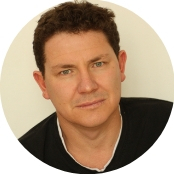 How functional is the Nescafe Dolce Gusto Oblo By Krups? With such a well known coffee brand as Nescafe, it’s not surprising that there’s a reasonable range of drink pods available. With over thirty different capsules, including teas and chocolate as well as the expected coffees, there’s plenty to choose from. If you like a bit more controllability than most coffee pod machines offer, then this machine is a good choice. The water lever gives you control over your preferred length, strength and temperature of any drink you choose. Like many coffee pod machines, only pods designed for the Dolce Gusto range can be used in the this model. Even though Nescafe produces other coffee pod machine types, such as the Nespresso, pods for those machines won’t fit this one. And while there’s plenty of drink types available – over thirty – some aren’t easily available and you may find yourself having to jump online to find your favourite. If you’re looking for a one-press-does-it-all coffee pod machine, then this isn’t the machine for you. Instead, you have to play barista and judge the temperature and water volume to make a coffee that meets your tastes. While the pods do have a bar system that shows how much water they need, it can still take a while to develop your skills. A criticism that is common with many coffee pod machines, and is also levelled against this one, is that the milk contained in the pods is somewhat sweet and artificial tasting. Not ideal if you prefer a milky coffee. Unlike many coffee pod machines, this machine puts you in control of the water temperature, whether you want hot or cold. It heats to a maximum temperature within forty seconds. However, some users feel that even at its max, the coffee isn’t hot enough for their tastes. While you’re in control of the rest of the water settings, the Oblo manages the water pressure. It offers up to a professional level 15 bar water pressure, which produces a rich velvety crema on espresso type coffees. The Nescafe Dolce Gusto Oblo By Krups is best described as uniquely stylish. It features a space-age curved design that encloses the cup as it’s filled. It comes in a range of colours to suit most interior decors. At 24.51cm x 18.01cm x 31.5cm, it’s not unreasonably big and should fit most kitchen spaces. One unexplainable quirk is that no matter what colour machine you choose, it will come with a red cable and lead. However, as they’re likely to be tucked away behind the machine, it shouldn’t be an issue for most people. For anyone looking for the most uniquely stylish coffee pod machine on the market, that offers controllability over strength, length and temperature of coffee, combined with a good range of drink types, then the Nescafe Dolce Gusto Oblo By Krups should be top of your shopping list. However, if ease of use trumps how it looks, then you should reconsider. Getting used to figuring out how much water you need to brew your perfect cuppa takes time to master, and you could be looking at some hits and misses along the way.